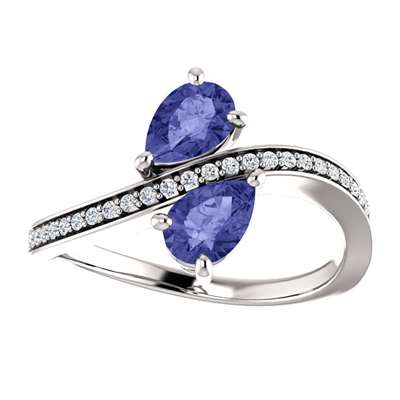 Fall in love with with this tanzanite and diamond two stone ring. The 14 carat white gold has a polished finish and measures 6mm x 4mm in length with 0.13 total carat weight. Pair this fun piece of fine jewelry with a gold chain necklace for a whimsical accessory. Makes a wonderful gift for the holidays. We guarantee our Tanzanite and Diamond Two Stone Ring in 14K White Gold to be high quality, authentic jewelry, as described above.